The directions from Lyon to the Chartreuse distillery go something like this: Exit the parking garage while trying to fire up your GPS. As it searches listlessly for a satellite (shouting "Look up!" or pointing it at the sky does not help), drive across the river with the vague feeling that the freeway might be in that direction. Eventually, a crisp Scottish voice will come to life and guide you to Quai Bellevue and from there you will find the ramp to Marseille/Genève/Grenoble/Porta de Croix Luizet/Périphérique Est, the pronunciation of which your Scottish guide will mangle in that endearing way characteristic of all British robots. Finally, you will find yourself, as I did, on the E711, stopping at regular intervals to deposit a handful of euros with the toll-takers, and arriving eventually in Voiron, a small town with much to offer, but half the morning is gone already and there's another distillery to visit after this one, so it's straight to the Chartreuse. The formula for Chartreuse is a secret, known only to two monks. It consists of 130 herbs and other plants, but precisely what goes in the bottle is anyone's guess. This makes a visit to the distillery rather fruitless. You'll see that something is being cooked up in copper stills and aged in enormous oak barrels, but you won't know precisely what. To make the visit feel more worthwhile, an elaborate museum has been created, complete with dioramas of Chartreuse-making activities, a short film, sepia photographs and crusty old bottles from past vintages. And there is, of course, a tasting room, where you can enjoy your choice of odd and interesting liqueurs not usually available in the States. In addition to the standard green and yellow versions found behind the bar back home, there are the V.E.P. bottlings, which have enjoyed more time in the barrel and benefitted considerably from it, as well as fruit liqueurs, a nice bitter gentian liqueur, and one made with génépi, a type of artemisia. If you spend a little time motoring around France's southernmost parts, you'll realize that green and yellow herbal liqueurs are not unique to the Chartreuse distillery. Draw a line from northern Spain across France to, say, Turin, and you'll find one brand after another. They all got their start as medicinal remedies, handfuls of herbs steeped in brandy with a little sugar added to make them go down easier. The yellow version is always lower proof and sweeter; distillers claim it was intended for women, while the stronger green version was a man's tonic. And while the ingredients are generally touted as being highly secret, smaller distilleries will generally drop the pretense with a grin and a shrug. After my visit to Chartreuse, the next stop was the Pagès distillery, a couple hours away in le Puy en Velay, where we walked past open bins of dried plant matter. "You may know some of these," the guide said. I did. I can say with certainty that lemon verbena, citrus peel, mace, star anise, fennel, angelica, and, well, a whole bunch of other herbs and spices, go into liqueurs of this sort. If it grows in the French countryside and it's not likely to kill you, it's probably in there. But you can also make your own herbal liqueur. Recipes for homemade versions were widely published in the 19th century; I'll give you a list of the herbs and spices mentioned most often and you can experiment from there. Whether you keep your own recipe a secret or not is up to you. Simple syrup (equal parts sugar and water, heated until the sugar dissolves then cooled). If Everclear brings back terrible memories from your college days, it's time to reassess. It's nothing but a very pure, all-grain spirit intended specifically for this kind of blending. But if you prefer vodka, just don't get the cheapest possible brand -- it'll have a nasty bite that all the herbs in the world can't overcome. Most recipes call for combining all ingredients, in whatever quantity suits you, and letting them age together for anywhere from a few days to a few weeks. But I have learned that fresh herbs can go from fabulous to dreadful very quickly in an infusion. 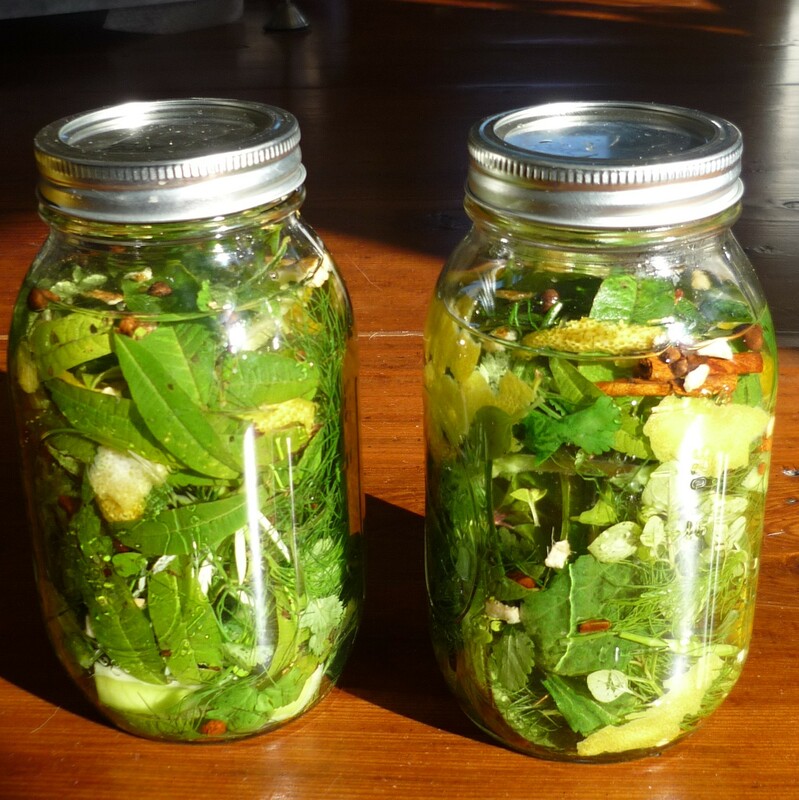 So my suggestion is this: Carefully wash and trim your herbs, then add them to a clean mason jar. Fill it with the booze, cap it tightly, and let it sit in a dark spot for five to six hours. Taste it. If it's wonderful, you're done. If you're not satisfied, give it a little more time, but more than 24 hours is pushing it. Strain the herbs, then add citrus peel and spices, both of which can sit in alcohol for much longer without developing an off flavor. Continue to taste it regularly. You might be pleased with the result after just a few days or a week. Then strain the mixture again, and add simple syrup to taste. Let it sit for three to four weeks, then drink it within a few months -- it's not intended to keep forever.